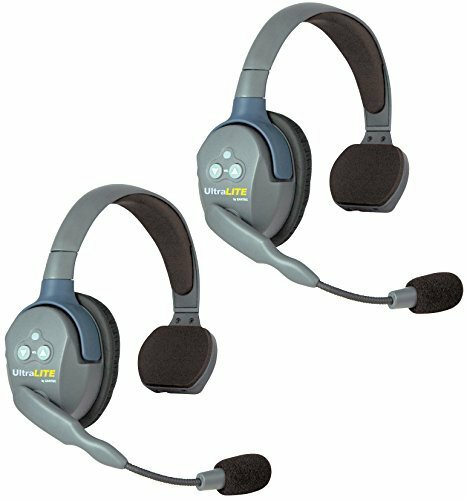 The Eartec UltraLITE is a breakthrough full duplex wireless headset that provides hands-free, two-way voice communications. At the heart of these systems is a specialty "Master" headset that relays the digital signals generated by up to three "Remote" units. The resulting open line talking pattern allows up to 4 people to talk simultaneously without pushing buttons. To formulate your standard UltraLITE system, select any combination of Double or Single ear headsets, up to 4 units. Wear on left or right ear: mic boom swivels 270 degrees. If you have any questions about this product by Eartec, contact us by completing and submitting the form below. If you are looking for a specif part number, please include it with your message.